If you want to see a Black-hooded Antshrike (Thamnophilus bridgesi) then Friends of the Osa’s Osa Biodiversity Center is the place to come. They often love living on the edge, forest edges that is, and for those us who live at or visit the Center they are an easy species to enjoy and tick off your life list. 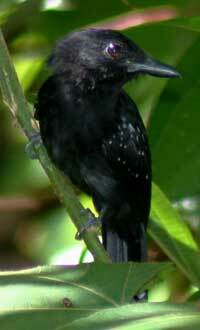 The Black-hood Antshrike is a common resident of the southern pacific slope of Costa Rica and Western Panama. The adult male is distinguished from other male blackbirds by the white spots on the wings. The females also sport the wing spots but she, unlike the male, has white streaks on her face and neck. Her underparts are also grayish olive in color. They can be found in the understory of mature to secondary forest and along edges. They are insectivorous birds gleaning insects and spiders from foliage. In particular, they are known to be opportunistic army ant followers taking advantage of the insects that army ant swarms kick up as they move through the forest. As Stiles and Skutch describe in the Birds of Costa Rica, Black-hooded Antshrikes move “with abrupt, heavy hops and flits” through the understory. They spend their time either in pairs or in mixed species flocks. They lay typically 2 eggs in a cup nest with the rim hanging from a horizontal fork. We also want to thank the Osa Recording Project run by Luis Vargas which enables us to bring you these sounds. We will keep you posted on the progress of this tremendous undertaking and when our CD will be available.